Indymedia Africa (IMCA) is a global network of media activists that aims to both connect and foster the use of Independent Media in Africa. Originating in the digital age activism of the late nineties, the Indymedia network has been surfing a wave of optimism regarding the potentials of new media and the digital public sphere to democratize publishing and the media. Information and Communication Technologies (ICTs) were understood as permitting “convergence” between people and movements in a horizontally organized fashion, thereby facilitating desired organizational cultures based on consensus and plurality, and producing “open spaces” relatively unstructured and uncontrolled by conventional political and economic structures. 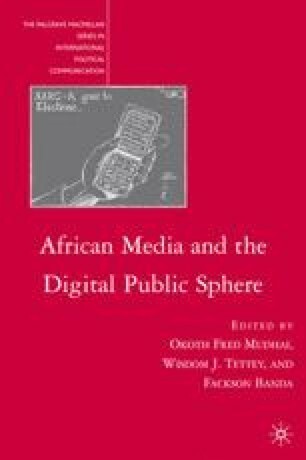 As an element of a “globalization from below,” IMCA considered these ideas as an answer to problems of democracy and freedom of expression in Africa and attempted to spread its own organizational principles into African independent media. In four years of creating virtual and physical convergence spaces, online forums, and Web sites, as well as organizing transnational gatherings, however, the IMCA network has had to face something of a reality check regarding the conditions of its own work and the African context. It has also gone through a process of action and reflection that appears symptomatic for a variety of initiatives of global cooperation in the field of new media, highlighting the limits of technological and pragmatic answers to the debate of the democratic potentials of these media. Böhm, S., S. Sullivan, and O. Reyes. 2005. “The Organization and Politics of Social Forums.” ephemera: theory and practice in organization 5(2). http://www.ephemeraweb.org/journal/index.htm (accessed June 1, 2008). Chesher, O. 1999. “Colonizing Virtual Reality: Construction of the Discourse of Virtual Reality, 1984–1992.” Cultronix. http://cultronix.eserver.org/chesher (accessed June 1, 2008). Flatz, C. 1999. Internet in Africa—Africa auf der Ueberholspur der Entwicklungsautobahn? Interasia. http://www.interasia.org/vietnam/hanoi_afrika.html (accessed June 1, 2008). Marquez, H. 2006. “Series of Global Protests to Begin in March.” Peace No War. http://peacenowar.net/newpeace/index.php?option=com_content&task=view&id=80&Itemid=0 (accessed June 1, 2008). Mwenda, A. 2006. “Foreign Aid and the Weakening of Democratic Accountability in Uganda.” Foreign Policy Briefing 82. http://www.cato.org/pub_display.php?pub_id=6463 (accessed June 1, 2008). Shikwati, J. 2005. “For God’s Sake, Please Stop the Aid.” Spiegel Online (July 4). http://www.spiegel.de/international/spiegel/0,1518,363663,00.html (accessed June 1, 2008).